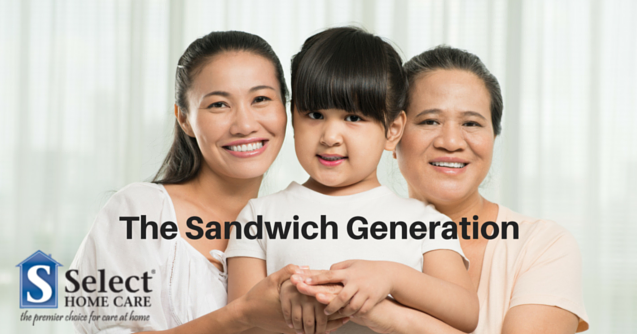 Home/Blog, Home Care Blog, Pasadena/Are You Part of the Sandwich Generation? Are you part of the “sandwich generation?” Do you have a living parent age 65 or older and are you raising a child under age 18 or supporting a grown child? Club Sandwich: those in their 50s or 60s, sandwiched between aging parents, adult children and grandchildren. OR those in their 30s and 40s, with young children, aging parents and grandparents. As the caregiver, you are pulled in many directions. You have your own family. You may work full time or part time. Providing the physical care your senior parent needs can be draining and less than rewarding. Not only do many provide care and financial support to their parents and their children, but nearly 40% of adults say both their grown children and their parents rely on them for emotional support. (pewsocialtrends.org) And according to Abaya, emotional care can be the most difficult part of caregiving. Unfortunately, family caregivers must try to balance all of their responsibilities, and often that comes at their own expense. Don’t Drain Your Assets – Preserve your own savings. Your children can use student loans, scholarships and grants to pay for their college. Also, use your parents’ assets to finance their care for as long as possible. Realistic Retirement Planning – Consider the fact that you may have additional sandwich generation expenses as you near retirement age. An adult child may return home and/or you need to provide financial assistance to a parent. Communicate With Your Parents – Have open dialogue with your parents regarding their savings, their desires for aging in place, and other important issues. Consider Long-Term Care Insurance – For many in the sandwich generation, long-term care insurance for your parents, and yourself, may be a great option. There are many factors to consider: cost of the coverage, time frame, and benefits. Often professional in-home care providers and nursing homes accept insurance payments. Find Support – Ask for help. Enlist other family members, friends or neighbors to assist with your aging parent. Find a professional in-home caregiver to help a few days a week. Also, there are many technology solutions available that can help ensure your senior parent is safe when you are not there. Take Care of You – You are a better caregiver and parent when you are healthy and not emotionally drained. Find ways to revive yourself, whether it’s taking a day off, reading a book, or simply taking a nap. And financially speaking, don’t sacrifice your retirement savings. Keep your own budget in order to create margin so you can help a loved one in need. Select Home Care Pasadena can help ease the burden of the sandwich generation. Our trained in-home care professionals can give family caregivers a few hours reprieve each week, provide daily care, or 24-hour care. We understand the importance of allowing your senior loved one to age in place. Please contact us today to discuss a care giving solution.